Breia, Mike & Sam: Team "Scare Snactics." Yeah, I know. 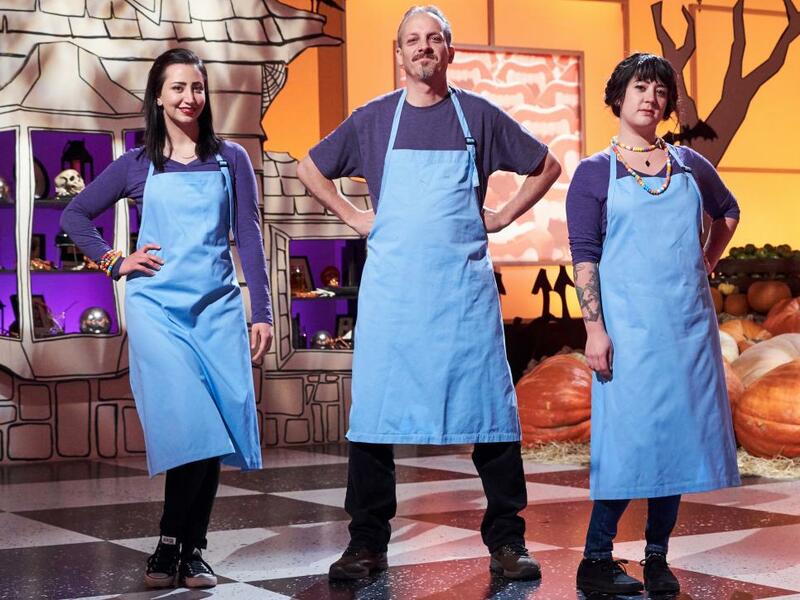 Halloween Wars is a weird show featuring pumpkin-carving weirdos, cake-making weirdos, and sugar sculpting weirdos. For season 7, Mike convinced the weirdos in charge of finding pumpkin-carving weirdos that he should be one of the pumpkin-carving weirdos. The Halloween Wars homepage is one place you can see all the weirdos. Another place is on Food Network in October. They re-run all the seasons around Halloween, so if you're inclined, you should be able to catch season 7, during season 8 and beyond. I am equally proud and embarrassed about Halloween Wars Season 7, having created some pretty cool things under pressure, and also having made some utterly moronic mistakes. But I treasure that experience and the folks I met, and I assure you that the literal and emotional scars have fully healed. Be sure to like/follow Mike on facebook and let him know what a weirdo he is and what you think of the weird stuff that happens on that weird show.